Steven Johnson won Race 2 in Round 2 of Paynter Dixon Touring Car Masters after an issue for Thomas Randle. Randle stretched the legs of his Ford Mustang out front off the rolling start as the field went four wide for second behind him. He lost the lead on Lap 4 after running off at the Southern Loop as a result of a puncture, with Johnson, also in a Ford Mustang, taking over the top spot. An incident at MG between Geoff Emery (Holden Torana), Tony Karanfilovski (Ford Mustang) and Bruce Williams (Holden Torana) brought out the Safety Car at the halfway mark of the race. Emery lost control under braking, spearing off the road and collecting Karanfilovski, while Williams climbed over the front of the latter’s car. Johnson was slow on the restart, with Adam Bressington (Chev Camaro) charging into the lead, but Johnson set up a move at MG on Lap 8 to get back past. Jim Pollicina (Holden Torana) almost followed through, before Ryal Harris (Chevrolet Camaro) and John Bowe (Holden Torana) moved ahead of him. Johnson crossed the line less than half a second in front of Bressington, Harris, Bowe and Cameron Mason after Pollicina spun at the Hayshed on the final lap and Emery copped a post-race penalty. Race 1 earlier in the day was deemed a non-result after a heavy crash for Robert Hackwood on the opening lap. Race 3 takes place on Sunday at 1205 local time/AEST. Paul Morris Motorsport’s Broc Feeney turned pole position into a 0.25s win over fellow rookie Hamish Ribarits in the first race of the 2019 Kumho Tyre Super3 Series. 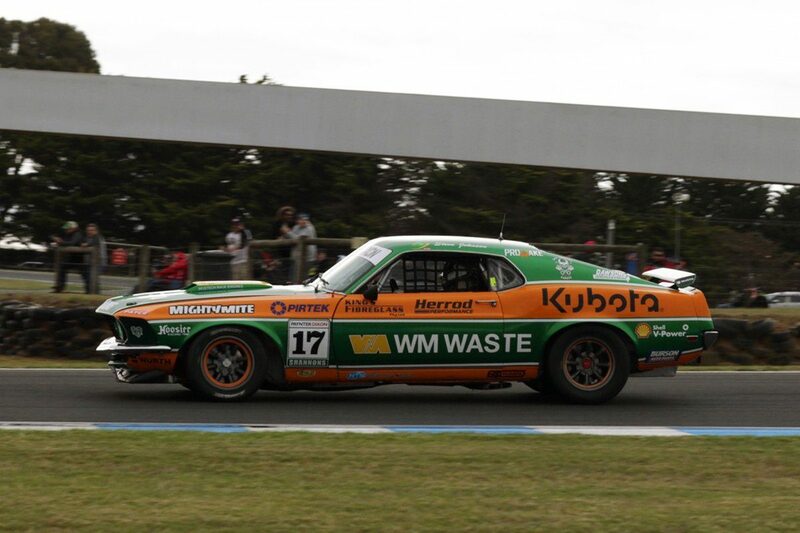 Ribarits got a better initial launch in his MW Motorsport FG Falcon but was passed by Feeney on the run to Doohan Corner as 2018 series runner-up Zak Best took up third position in another MWM FG. While the three of them initially gapped the rest to the tune of around a second a lap, Best began to fall away and left Ribarits to tail the #67 FG Falcon. Feeney had seven tenths in hand as they started the 10th and final lap and the 16-year-old hung on to become a Super3 race winner older than only Alex Rullo when the West Australian broke through in 2015. The reason for Best’s loss of pace turned out to be a tyre problem but, fortuitously, his right-front finally failed only between the finish line and Doohan corner on his cool down lap. Jayden Ojeda recovered from a poor start to finish fourth in the Anderson Motorsport FG Falcon, one position below where he started. Nic Carroll (MWM FG Falcon) and then Matt Powers (Aussie Driver Search FG Falcon) followed, making it five rookies in the top six after they both got by relative Super3 stalwart Jon McCorkindale (Mac Motorsport FG Falcon), who was home a position ahead of another debutant in eighth placed Matt McLean (Image Racing FG Falcon). The encounter ran without Safety Car intervention despite the mid-race recovery of Tony Auddino’s awkwardly placed BF Falcon at the start of the Turn 4 Hairpin run-off. Auddino had spun after an apparent touch from Jim Pollicina and when he couldn’t get going again, his car was dragged away under local yellow. Two more races will be held tomorrow at 1035 (10 laps) and 1600 (12 laps). Tim Brook was dominant in an eventful Toyota 86 Racing Series season opener at Phillip Island. Pole-sitter Brook won by two tenths, after coming under pressure on the last lap and being challenged out of the final corner to the stripe by Lachlan Gibbons. 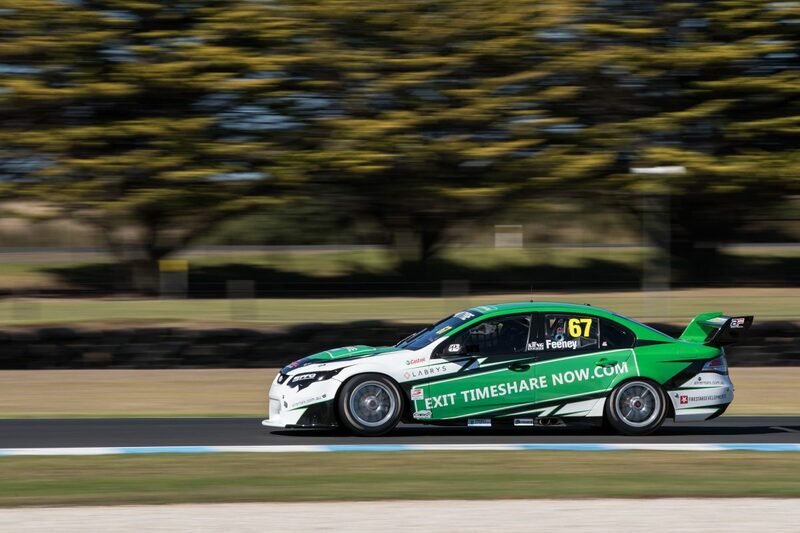 It was an even start off the front row, but Jake Burton found himself ahead of Garth Tander in second by the time they got to the Southern Loop. Tander slipstreamed back past Burton at the start of Lap 2, with the latter losing a handful of positions. John Iafolla and Luke King came together on Lap 3 on approach to Lukey Heights, with King ending up in the gravel trap on the outside. An enormous battle pack emerged covering ninth through to 17th including Leanne Tander, who was trying to fight her way through. 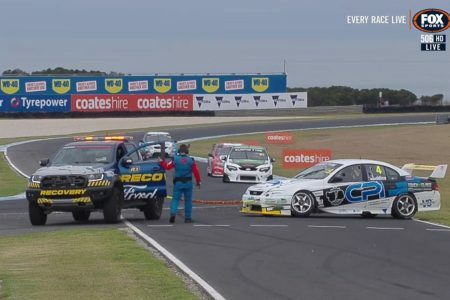 Kade Crawford, Luke van Herwaarde and Hayden Jackson tripped over each other at MG in the closing stages, with Crawford’s car ending up stricken on the inside of the circuit. Gibbons seized second from Tander and then chased after Brook, who was almost two seconds up the road. Brook narrowly managed to hold on to the victory, as Gibbons, Tander, Jaeden Ransley and Ben Grice rounded out the top five. The Toyota 86 Racing Series returns to the track tomorrow for races at 1000 and 1235.